Last month...wait...no at the very end of March...the Daily News snapped some pics of us for an article they ran about NYC based cookbooks. We were pretty psyched that our book, New York a la Cart: Recipes and Stories from the Big Apple's Best Food Trucks was featured alongside Daniel Humm and Will Guidara's I Love New York: Ingredients and Recipes and Franny’s: Simple, Seasonal, Italian among others. We were also psyched to do our photo shoot at Big Gay Ice Cream's West Village Shop where we could model both our book and some of their goods. Blondie got the Salty Pimp with sprinkles while I went for a swirl of their coffee and cardamom...oh my soft serve, it was delicious. Super creamy. Cardamom can be a strong flavor and this had nice hints of cardamom without being too overpowering. It paired really nicely with their coffee flavor. If you want a full write up of their soft serve from a ice cream expert, check out Serious Eats NY editor, Max Falkowitz's post. 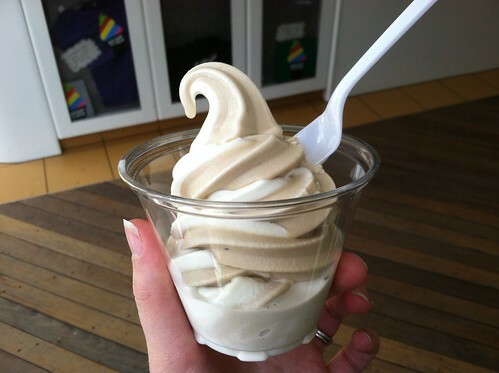 The special soft serve is available at their West Village Shop. Follow Big Gay on Twitter @biggayicecream for details about what flavors are in rotation. I'm dying to try the Yellow Cake and Brownie Batter swirl. DYING. TO. TRY. IT. Hopefully those flavors will be on the docket again soon.